NOSHOK provides custom Measurement Solutions for tire plants that manufacture everything from automobile and truck tires to large construction equipment tires. One such solution was provided for a top tier tire company with retreading plants throughout the United States and Canada. One of the many processes in a tire plant involves curing or vulcanization. This particular plant was in the process of developing a new curing process which would reduce the curing time of a tire from 3 - 4 hours to just 1.5 - 1.8 hours. The process would also increase productivity with significant cost savings, giving them an edge over their competition. The new technology incorporates the use of a “curing chamber”, where as many as 25 tires could be cured at a time. The process involves the precision measurements of pressure, temperature, and time - all monitored by computer sensing controls. NOSHOK assisted in the custom design and supply of a manifold for the curing chamber. Among other components, up to 25 sensors were needed to monitor pressure per manifold. Multiple sensors were tested but ultimately NOSHOK 300 Series Compact OEM Transducerswere chosen due to their high level of performance and cost-effectiveness. The NOSHOK transducers contributed to the success of their process and helped them to get this new technology working efficiently within their plants. Another NOSHOK custom solution was provided at a facility in which large earth moving equipment tires are manufactured. NOSHOK 200 Series Low Pressure Diaphragm Gauges were provided to monitor a process where pressure is applied to membranes (large inner-tubes) to support the tire while waiting to be placed in the press for curing. NOSHOK also addressed an application at a tire plant that manufactures ATV tires for vehicles including Polaris and Artic Cat, where there was a need for pressure sensors to monitor their tire presses. The plant was having issues with a competitor’s transmitter continuously falling out of calibration, known as calibration drift. The tire manufacturer decided to make the switch to NOSHOK sensors, based on our renowned quality and reliability, as well as our dedication to analyzing issues and providing customized solutions. The NOSHOK sensors performed much better than their previous model, however some calibration issues began to arise again. connection can be seen in the photo below. NOSHOK recommended that a NOSHOK Type 25 Diaphragm Seal be assembled on a NOSHOK 100 Series Transmitter to protect it from the corrosion. The transmitters with diaphragm seals were installed and evaluated over several months, and performed very well with no calibration drift. We continue to work on additional assemblies to complete all of their presses with this solution. NOSHOK has also provided solutions at several facilities that manufacture truck and bus tires. NOSHOK 615 High Accuracy Heavy-Duty Transducers are being used on their presses, while NOSHOK 400 Series All Stainless Steel Gauges provide local indication. NOSHOK is dedicated to providing customized engineered solutions to address specific process requirements. These are just a few examples of how NOSHOK provided solutions for consistently high quality performance at multiple tire press plants. If you have a Power Unit application, your NOSHOK Regional Sales Manager or the NOSHOK Customer Support Team is ready to provide a custom Measurement Solution in the design stage, which can reduce your manufacturing cost and improve the unit’s performance. Hydraulic Power Units are essentially the heart of a hydraulic system. Consisting of a motor, a reservoir and a hydraulic pump, these units can generate a huge amount of power to drive almost any kind of hydraulic force. These units are used in a wide range of applications that require heavy and continuous lifting or other requirements for the repeated use of powerful and directional force, including Machine Tools, Automation, Mobile Equipment, Oil & Gas, Marine and much more. Hydraulic Power Units require a variety of pressure and temperature measurement instrumentation, as well as valves to keep them running smoothly and efficiently. NOSHOK offers a variety of Measurement Solutions that are ideal for this application. The pressure a power unit can deliver at the outlet is known as the operating pressure. The power unit may be indicated as a single pressure rating, or it can be rated to operate over a range of pressure. This pressure can be measured mechanically using pressure gauges both at the pipe and at a panel, or for more automated units it can be measured electronically using pressure transmitters and transducers. The cooling method can be none, or via heat exchanger or fan-driven oil cooler. Therefore, temperature must also be measured and regulated. This can be achieved by using bimetal thermometers and/or vapor actuated thermometers, or temperature transmitters such as the cost-effective 810 Series Compact OEM Temperature Transmitter, 800 Series Platinum Resistance Temperature Transmitter, and the 850 Series Electronic Indicating Temperature Transmitter/Switch. All hydraulic power units incorporate some type of integrated pump. Some units come equipped with multi-stage pumps, which operate like multiple pumps connected in series. Hydraulic power unit pump types include single stage, double stage, three or more pump stages, and multiple pump units. Pressure switches are often employed for functions including pump turn on and shut off. Valves can be used to control direction, pressure and amount of fluid flow through the power unit, including block and bleed valves, multi-port valves and mini needle valves. O-rings provide excellent sealing performance in the bonnet assembly at a relatively low cost. Their mechanical properties depend on temperature, pressure, and chemical exposure. The service conditions can affect o-ring strength, flexibility and resilience, which needs to be maintained for proper sealing. At low temperatures, elastomers become harder, less resilient and lose their memory. At elevated temperatures the softness lowers the strength which in turn limits o-ring effectiveness under pressure. The media can have a significant impact on the suitability of o-ring performance. Therefore, proper selection of o-ring material is very important. NOSHOK also offers optional packing bonnet assemblies for our needle & manifold valves. To overcome the service limits of elastomers, two of the most common packing materials, PTFE and GRAFOIL®, are used to extend the range of temperature, pressure and fluid exposure. PTFE has a wide range of chemical resistance and may be used in applications which are incompatible with elastomers. PTFE is thermally stable across a wide range of temperatures and has a service range of -100 °F to +400 °F. PTFE can temporarily withstand temperatures of -240 °C and has been successfully use in cryogenic applications. GRAFOIL® is a flexible graphite made from pure, natural graphite flake and is resistant to heat, fire, corrosion and certain aggressive chemicals. GRAFOIL® packing is chemically resistant to nearly all organic and inorganic fluids, except for highly oxidizing acids and chemicals. This outstanding chemical compatibility generally exists across GRAFOIL®’s entire temperature range of -400 °F to 850 °F. It is important to note that all materials are susceptible to accelerated chemical attack by at least one chemical compound, and increasing the service temperature may also weaken a material’s ability to withstand reactive chemicals. Packed valves rely upon the mechanical compression of a soft packing material against the valve stem. This compression of the packing material eliminates all but extremely small leak paths between the packing material and valve stem. Pressure is a simple concept, defined as the force applied perpendicular to the surface of an object per unit area over which that force is distributed. There are many ways to reference and identify pressure, which is largely dependent upon the application. Gauge Pressure (psig) references the atmosphere around the sensor, or ambient air pressure. Put simply it is the absolute pressure minus the atmospheric pressure. The sensing element has a deflection due to a pressure change, and therefore a reference point is required to identify exactly the pressure is being measured. Pressure sensors that use Gauge Pressure (usually psig, barg, and kpag include a vent. This vent can be built in to the sensor itself, or through a tube in the electrical connection. The vent is positioned to use atmospheric pressure as a reference point for the sensor to measure the media, so when the pressure port is exposed to the atmosphere, the sensor will read 0 psig. Using Gauge Pressure ensures that at any location in the world, the sensor will always reference the location in which it is installed. While Gauge Pressure is measured from atmospheric, Absolute Pressure (psia) is measured from absolute zero pressure, so when the pressure port is exposed to the atmosphere the sensor will indicate atmospheric pressure (approx. 14.7 psia). Absolute Pressure uses a full vacuum as its reference - it is the gauge pressure of the media plus the pressure of the atmosphere. In different locations and elevations, the reference point can change because of atmospheric pressure variations. The atmospheric pressure varies with temperature and altitude above sea level. An absolute pressure sensor eliminates the reference to varying atmospheric pressure and relying on a specific pressure range for reference. Sealed Pressure (psis) is referenced to the prevailing atmospheric pressure which is hermetically sealed in the chamber within the sensor. No venting is needed because the reference point is pre-determined. When the pressure port is exposed to ambient atmosphere the sensor will indicate 0 psi when the ambient atmosphere is identical to the sealed atmosphere. These sensors are useful in applications where it is not possible to provide a vent path, such as a depth sensor used inside a submersible vehicle with no surface vent tube, in which the sensor needs to measure depth relative to atmospheric pressure at the surface. A sealed pressure sensor can also be used to provide additional containment for high pressure safety in case the diaphragm bursts. Differential Pressure simply indicates the pressure difference between two pressure measurements. A differential pressure sensor is used to identify the difference between two separate pressure input ports For example, differential pressure is used to monitor the pressure drop (or loss) from area of an object to the other, such as pressures outside and inside a pipe, levels within a pressure vessel, before and after a barrier in a flow path, or even between two points along any flow path. psi (pounds per square inch): The unit of measure for one pound of force applied to one square inch of area - psi is the traditional unit of pressure in the imperial and US customary systems and is not part of the International System of Units (SI). bar: One bar equals the atmospheric pressure on the Earth at sea level, which is exactly equal to 100000 Pa. The bar unit is a metric unit of pressure, but not part of the International System of Units (SI). Pa (Pascal): One Pascal is the International System of Units (SI).derived unit of pressure. One Pascal is defined as one newton per square meter. inHg (inches of Mercury): inHg is defined as the pressure exerted at the base of a column of mercury exactly 1 inch (in) high, at gravity and 0°C (32&dg;F). The inHg is not part of the International System of Units (SI) 1 inHg = 3.38638 kPa. inHg are typically used barometric pressure. inH2O (inches of water): The pressure exerted at the base of a column of water exactly 1 inch (in) high, at gravity and 4°C (39.2°F). The inH2O is not part of the International System of Units (SI) 1 inH2O = 0.249082 kPa. It is typically used for a differential pressure measurement or in low pressure water applications. RTDs (resistance temperature device) are temperature sensors that are commonly used in a variety of industrial applications including industrial boilers, petrochemical, exhaust gas monitoring and food processing. RTD sensors have a higher accuracy than thermocouples and thermistors over a wide temperature range, and are more stable over time. Simply put, an RTD is a sensor whose resistance changes with temperature in a consistent repeatable manner. An RTD can provide highly accurate and consistent temperature measurements because the change in resistance of certain materials is so predictable. Most RTD sensors have a response time between 0.5 to 5 seconds and commonly feature a platinum based element, but can also be constructed with nickel or copper. RTDs made with platinum (also known as PRTs - platinum resistance thermometer) are used most often today due to their higher temperature capabilities, better stability and repeatability. Probe type RTDs, such as the NOSHOK 900 Series, generally consist of a rigid probe with direct mounted connector or extension cable. Assembly type models, such as NOSHOK 910/915 Series, usually consist of a rigid probe assembled with a connection head (junction box). Direct immersion probes have the RTD protective sheath (the probe) welded to process fitting similar to temperature gauges - this offers better response but mechanical protection is limited. Access to a process under operation is also limited. 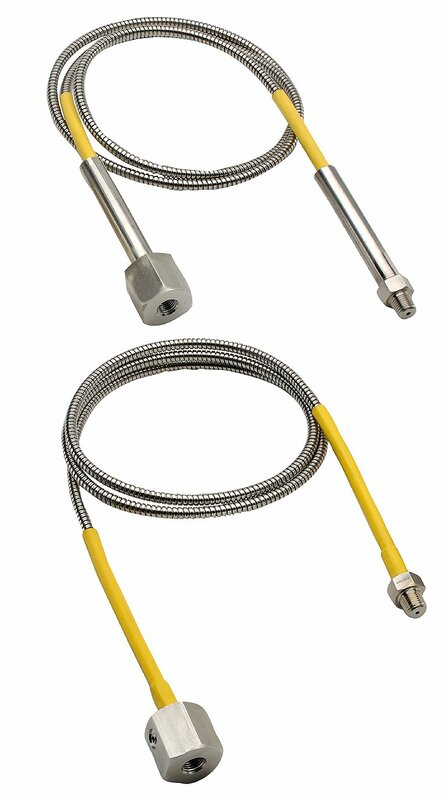 Assemblies for Thermowells have the RTD probe typically spring loaded in the connection fitting - this ensures good .thermal contact and removes dead space in well tip. RTD connection heads are available in cast aluminum, white polypropylene, and cast 316 stainless steel. White polypropylene is popular for sanitary and chemical applications, while stainless steel is often used in food, pharmaceutical, biotech and chemical applications. Aluminum and stainless steel are preferred for industrial applications. Intrinsically safe explosion-proof enclosures are also available for hazardous environments. RTD terminal blocks are often used in junction heads for connecting sensors to signal wiring. Each position has 2 connections, one connection from sensor, the other for signal wire (Example: for a single 3 wire RTD, a 3 position terminal block is needed - 6 connections total - 3x2). RTDs can be used in conjunction with a thermowell to protect the instrument, and the probe can be replaced in some models without possibility for leakage. RTD Transmitters are used to convert the sensor signal to the industry standard 4 to 20 mA or to a voltage output signal, and allow signal calibration for precise outputs proportional to temperature. RTDs are highly accurate, stable and repeatable temperature sensors, and are resistant to contamination under 660°C. Because of their high repeatability, they can accurately measure identical temperatures even when exposed to multiple heating and cooling cycles with nominal discrepancies, making them an ideal solution for many industrial applications. Click for more info on NOSHOK Industrial RTDs. If you’re an energy producer in the United States, you are probably already familiar with the EPA’s Quad O regulations. These regulations were designed to establish emission standards for the control of volatile organic compounds (VOC) and sulfur dioxide (S02) emissions specific to onshore oil and natural gas facilities constructed, modified or reconstructed after August 23, 2011. Quad O states that all storage tanks must have a control device (either an enclosed combustor or a vapor recovery device) by April 15, 2015. Affected facilities include hydraulically fractured gas well completions, storage vessels, continuous bleed pneumatic controllers, reciprocating and centrifugal compressors, equipment leak detection and repair, and S02 sweetening units. Crude oil storage tanks hold oil for a period of time to stabilize flow between production wells and pipeline or trucking transportation sites. During storage, part of the crude oil vaporizes or “flashes” and collects in the space between the liquid and the top of the tank. As the temperature of the crude oil increases, the amount of vaporization increases along with the pressure in the tank. As the vapor cools, it condenses and pressure inside the tank decreases. Vapor Recovery Units are automated systems which automatically start, stop and bypass as pressure is increased in the tanks, and capture up to 95% of vapors to prevent them from escaping and posing health and environmental risks. Here’s another significant benefit that VRUs provide to producers: recovered vapors consist of light hydrocarbons containing propane, butane and gasoline, which contribute to the gravity of crude oil. When they are vented to the atmosphere a reduction of gravity in the oil occurs, decreasing its value. Because recovered vapors have a much higher BTU content than pipeline quality natural gas, they can result in substantially increased profits for the producer. To ensure optimal control and monitoring of vapors, a VRU must have reliable instrumentation in place that is capable of accurately measuring low pressure. 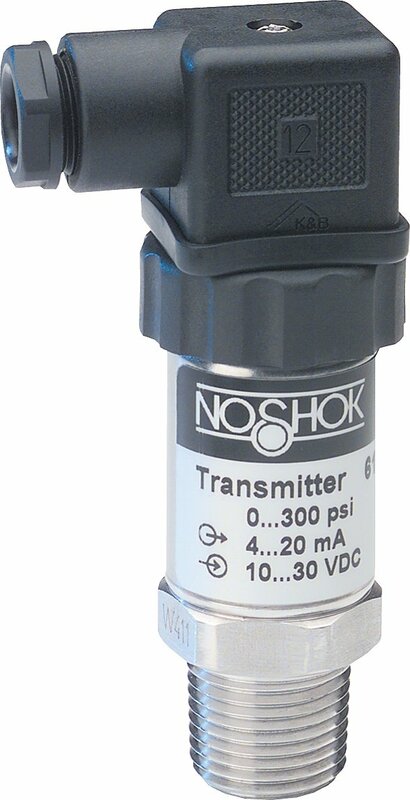 The NOSHOK 625/626 Series Intrinsically Safe Transmitter is ideal for this application, with low pressure ranges including -4 oz/in2 to 12 oz/in2, 0 oz/in2 to 12 oz/in2, 0 oz/in2 to 16 oz/in2, 0 inH2O, to 50 inH2O and 0 inH2O, to 100 inH2O (as well as standard ranges from vacuum to 15,000 psi with absolute ranges available). This transmitter provides the high level of accuracy required for this application, ±0.125% Full Scale (BFSL), and is Factory Mutual & CSA compliant for Class I, II and III Div. 1, Class II and III Div. 2, & Class 1 Zone 0. The NOSHOK 625/626 Transmitter features welded 316 stainless steel construction with no internal o-rings, gaskets or seals, and is entity approved for use with all approved Zener barriers where required. Hammer Union Transmitters are used in a wide variety of harsh and viscous oil & gas exploration and drilling applications both onshore and offshore. A Hammer Union is a pipe connection designed to be loosened or tightened by hammer blows on protrusions known as hammer wings. A Hammer Union is usually used on high pressure lines where quick disconnections are necessary. Due to the demands placed on these sensors, shock and vibration resistance are key in their design. Hammer Union Transmitters are ruggedly constructed for use with highly abrasive and corrosive media, and are specifically designed to withstand harsh environments such as acidizing, blowout preventers, choke & kill manifold, fracturing & cementing, new well development and extraction, oil and gas drilling, service and cement trucks, standpipe, stimulation, mud logging and mud pumps, oil field & offshore, and well head pressure measurement. Hammer Union Transmitters monitor circulating systems to measure mud and media flow during the extraction processes. They can reduce downtime and lower service costs by providing accurate, reliable data to detect slight changes in pressure, so that media flow pressure can be quickly adjusted during drilling operations. Drilling operators can then maximize oil withdrawal rates and monitor potentially hazardous conditions such as gas bubbles to increase safety and efficiency. They are easily replaced on location, which provides convenience and fast response time. Constructed with a heavy-duty Inconel X-750 diaphragm and connection, NOSHOK’s Intrinsically Safe Hammer Union Transmitter features a 2” 1502 wing union, offers ranges from 5,000 psig through 20,000 psig and has a 4 mA to 20 mA, 2-wire output signal. Each NOSHOK sensor comes with a Certificate of Calibration. This NOSHOK transmitter is CSA compliant for hazardous location equipment and also NACE MR0175/ISO 15156 compliant. As EPA regulations to reduce the emissions produced by the disposal of saltwater and other caustic by-products of oil and gas production become more stringent, reliable low pressure measurement has become even more critical. Vapor Recovery Units are designed to comply with these EPA standards, provide the producer with additional profits that may be lost due to stock tank vapor emissions, and eliminate stock tank vapor emission into the atmosphere. Recovered vapors have a significantly higher BTU content than natural gas from the pipeline, therefore recovered vapors can be more valuable than methane alone. Vapory Recovery Units, along with salt water disposal systems and storage tanks, require precise pressure measurement to ensure optimal control and monitoring, and maximize recovered emissions and profit to the producer. NOSHOK 625/626 Series Intrinsically Safe Pressure Transmitters offer low pressure ranges that are ideal for vapor recovery control, salt water disposal control systems, tank vent monitoring systems and liquid level monitoring in shallow tanks. Standard ranges are from vacuum to 15,000 psi, and absolute ranges are also available. 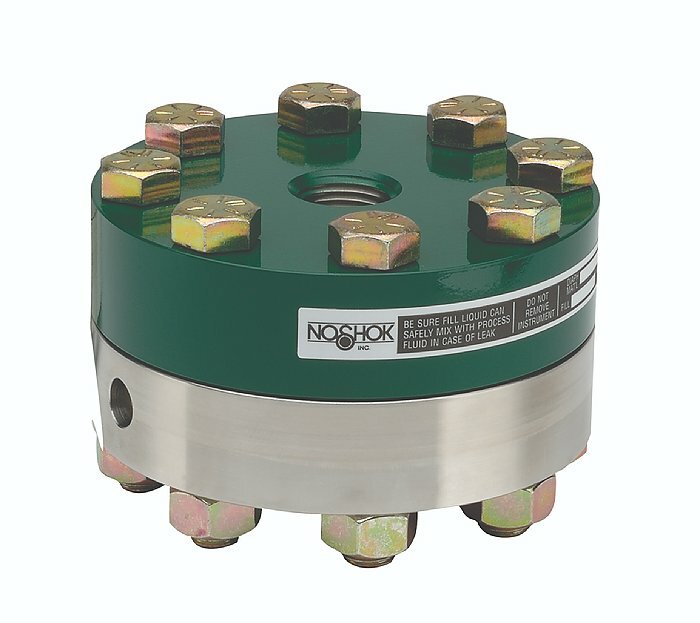 NOSHOK 625/626 Series transmitters are available with a standard threaded connection as well as a flush diaphragm configuration, and are constructed with welded 316 stainless steel with no internal o-rings, gaskets or seals. NOSHOK 625/626 Series transmitters are entity approved for use with all approved Zener barriers where required. The technology used in today’s pressure gauges has been around since the mid-eighteen hundreds, and the pressure gauge is still one of the most common methods of measuring pressure today. The majority of pressure gauges today still incorporate the Bourdon tube, socket, and geared movement; along with a pointer and dial to indicate process pressure. Since the pressure gauge is a purely mechanical device, attention to three process conditions is necessary. The three factors that can adversely affect accuracy and performance are temperature, vibration and pulsation. Temperature Influence: For every 100 °F shift in temperature from which the gauge is calibrated, the user can experience up to a 2% additional error in reading. The cause is the change in the elasticity or spring rate of the Bourdon tube element with temperature. While it is difficult to circumvent the influence of ambient temperature, we can address the influence of process temperature. In steam service, the common practice is to install coil syphons or pigtail syphons to dissipate process heat. Another common practice is to install a diaphragm seal with capillary to separate the gauge from the high heat source. There are many options available with fill fluid in the seal and capillary system to withstand temperatures up to 600 °F. In severe cold ambient conditions, many users elect to heat trace their instrumentation via electric or steam trace. Process and ambient temperature is an important consideration when selecting and applying pressure gauges. Vibration Influence: Vibration due to pumps, motors, and other rotating equipment can cause excess wear and possible premature failure of internal working parts of a pressure gauge, which include the Bourdon tube and the movement or gear mechanism. Vibration also causes difficulty in accurate reading of the gauge, due to pointer oscillation. One of the most common causes of pressure gauge failure is exposure to continuous vibration. The most widely accepted remedy is to utilize a liquid filled pressure gauge. The fill fluid of choice is either glycerine or silicone. Liquid filled gauges address not only pointer oscillation, but also serve to protect and lubricate the internal geared movement. Pulsation Influence: Process pulsation can occur around the discharge of pumps as well as quick operating valves. Many users assume that liquid filling a pressure gauge will fully address pulsation. Although a liquid filled gauge helps to dampen the effects of pulsation, it often does not fully address this process condition. Pulsation dampeners are installed upstream of the gauge socket and they can be a piston-type snubber, a sintered metal snubber, or a threaded in-flow restrictor in the socket of the gauge. A needle valve installed upstream of the gauge that is “pinched down” or slightly opened, is another common practice to address pulsation. It is not recommended to rely solely on a needle valve to address pulsation, due to the fact that the user could inadvertently open the valve, and thereby negate flow restriction. In clean fluids (gases or clean low viscosity liquids) a threaded orifice/flow restrictor or a sintered metal snubber is the least costly way to address pulsation. In dirtier and higher viscosity fluids a piston snubber is usually installed. In many fluid power applications, the medium that the instrument will contact may be at an elevated temperature beyond the operational limit of the measuring instrument. Selecting an instrument with a high temperature rating or using diaphragm seals to provide isolation from the medium may not be feasible from a design or economic standpoint. One way to address this situation is to mount the instrument with a short length of tubing away from the hot area where the measurement needs to be made. With a dead ended pressure chamber, the tubing will effectively dissipate much of the heat and bring the medium in contact with the measuring instrument down to a lower temperature that is within its safe and accurate limit. The following chart provides the basic information needed to determine the size and material of the tubing needed. The pressure vessel is insulated to limit radiant heat transfer to the transducer – the major source of thermal input is via the connecting tube. The pressure medium has a coefficient of thermal conductivity less than 4btu / hr / ft2 / ft / °F. This figure encompasses a wide range of liquids and gases. Orifice meter chart recorders monitor the flow measurement of fluids across an orifice plate or other differential producing element. The chart recorder measures the differential pressure across the primary element, such as an orifice plate, and records the differential pressure on a circular chart. The differential pressure, usually in inches of water column, represents volumetric flow rates over time. While this is an older technology, the industry still relies upon circular chart recorders for monitoring critical flow rates. NOSHOK now offers a variety of valve solutions to easily integrate into this system while providing reliable isolation, equalization, and bleed/calibrate functions. NOSHOK Meter Manifolds are specifically designed for use on flow recorders. They can be configured in 2-valve, 3-valve and 5-valve designs, depending on the application requirements. The soft seat design provides a 6,000 psi pressure rating @ 200 °F. NOSHOK Meter Manifolds feature a replaceable Delrin® seat and straight through porting for bidirectional, high capacity flow and easy roddable cleaning. A blow-out proof stem provides a secondary stem seal in the full open position. An FKM o-ring seal and PTFE back-up ring below the stem threads protect from corrosion & galling. PTFE packing is optional. NOSHOK Flare Pattern™ 5-valve natural gas manifold valves are an ideal solution for applications involving differential pressure transmitters or flow computers. The equalization valves and the vent valve are angled to provide maximum clearance during operation without having to invest in additional material to provide spacing for clearance. Backed by a 3-year warranty, NOSHOK Flare Pattern™ valves feature a patented body-to-bonnet, metal-to-metal seal which is designed to significantly increase the pressure range of the valve (U.S. Patent 7,758,014). 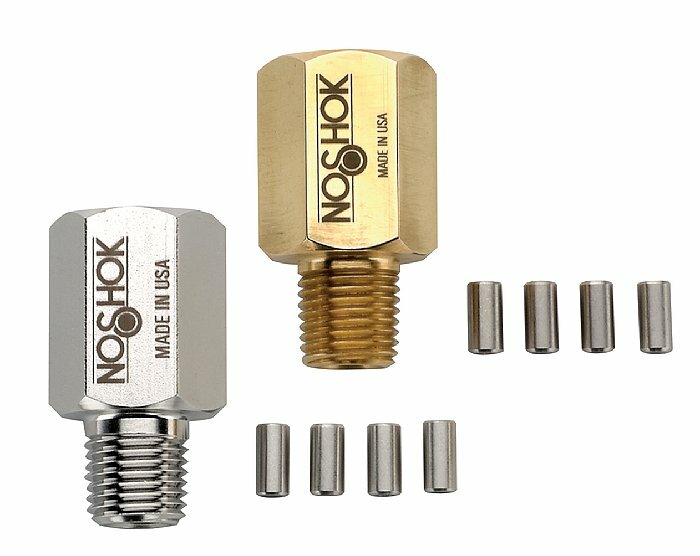 NOSHOK soft tip valves also feature a patented Delrin® non-rotating soft tip stem, and a back-up metal-to-metal seal (U.S. Patent 6,820,857). NOSHOK Flare Pattern™ valves are available in block, single flange, or double flange connection for remote or direct installation. NOSHOK 5030 Series hard seat valves have a 10,000 psi pressure rating @ 200 °F, and the 5130 Series soft seat/tip valves have a 6,000 psi pressure rating @ 200 °F. Multiple options are available including packings, stem tips, o-rings and handles, and we also offer accessories including dielectric kits, futbols, mounting kits, differential pressure to static plates and static adapters. For more information on these product or other NOSHOK measurement solutions, contact NOSHOK Customer Support at 440.243.0888, visit our website at www.noshok.com, or e-mail. NOSHOK provides a variety of application-focused assemblies to the water & wastewater industry, including an all non-metallic diaphragm seal & pressure transmitter/switch. This tested and proven solution is used in multiple municipalities, and replaces much larger & heavier gauge/switch/diaphragm seal assemblies for pump shut-off protection. This solution delivers a high level of repeatability and durability, and includes an electronic indicating pressure transmitter with two alarms protected by a corrosion-resistant, chemically inert PTFE diaphragm seal - with one simple connection. Its compact size and light weight significantly decreases possible leak paths, and with no moving parts to wear out, this instrument assembly provides a significantly extended service life over mechanical analog systems. The instrument and seal can be used with a power supply and Form C relays to easily integrate into any AC chemical feed system. NOSHOK offers is an AC to DC retrofit package which easily integrates with this assembly to allow operation with 110/240 VAC systems. Featuring a solid state relay - (10A at 250 VAC), this unit is DIN rail mountable with a NEMA 4X enclosure. NOSHOK also offers a cage-protected submersible level transmitter designed for severe high solids environments such as sewage, lift stations, storm canals, wet wells and slurry tanks where sludge, slurry or turbulence may be present. The assembly is welded at the cap, making it ideal for a wide variety of industrial and municipal liquid level measurement applications requiring watertight protection. Multiple options are available including a lifting ring, cable clamp, cable junction box, filter element and desiccant cartridge. NOSHOK’s distribution manifold assembly connects multiple instruments to one diaphragm seal, eliminating multiple connections that lead to possible leak paths. Its lower fill volume also enhances performance and decreases temperature error. Multiple sizes and configurations are available. NOSHOK offers a range of instrument options that provide a means of performing diagnostics and identifying spikes in a system to prevent damage. The NOSHOK 300 Series Brass Case Gauge with an optional maximum indicating pointer, also known as the “Troubleshooter”, is an excellent tool for performing system set-up and diagnostics, by indicating peak process pressure to identify spikes in a system. 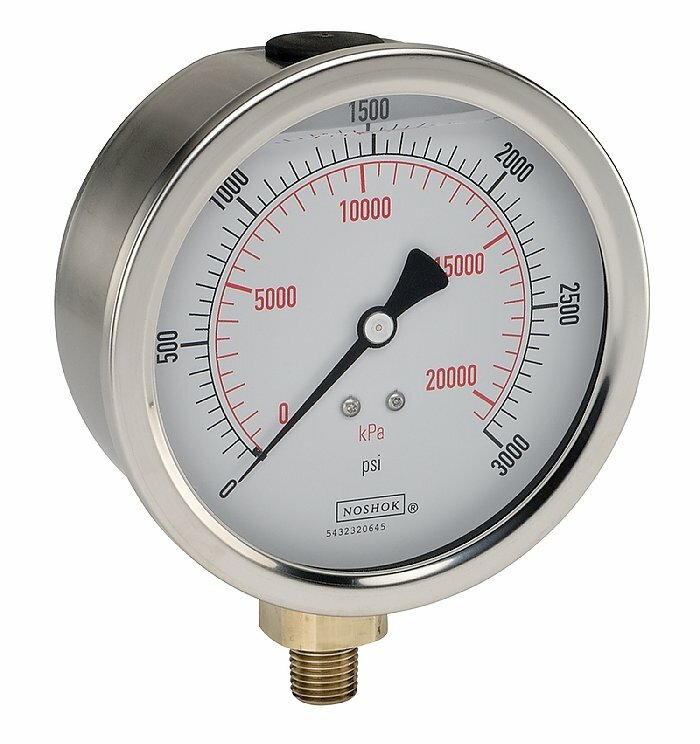 This gauge offers pressure ranges from vacuum through 15,000 psi, and the maximum indicating pointer option is available with 2-1/2” case, bottom or back connected. The 300 Series Gauge’s heavy-duty one-piece die casting integrates all components into a solid unit to eliminate leakage, and its glycerine fill greatly reduces the effects of vibration, pulsation and shock. The maximum indicating pointer is easily reset with a knurled thumb screw. The NOSHOK 300 Series Gauge is available with many other options and accessories, including front or rear flanges, chrome cover ring, chrome bezel with U-clamp, multiple lens options, adapter ring, 7/16”-20 straight thread, laser marking, stainless steel tagging, and a variety of orifice sizes. The NOSHOK 1000 Series Digital Gauge is another option that comes standard with minimum and maximum memory that is easily accessed via a front panel button. Optional enhanced software is available that enables the digital gauge to display the minimum or maximum pressure indication at all times. The NOSHOK 1000 Series Digital Gauge provides up to 4,000 hours of battery life, with pressure ranges from 30/30 psi to 10,000 psi. 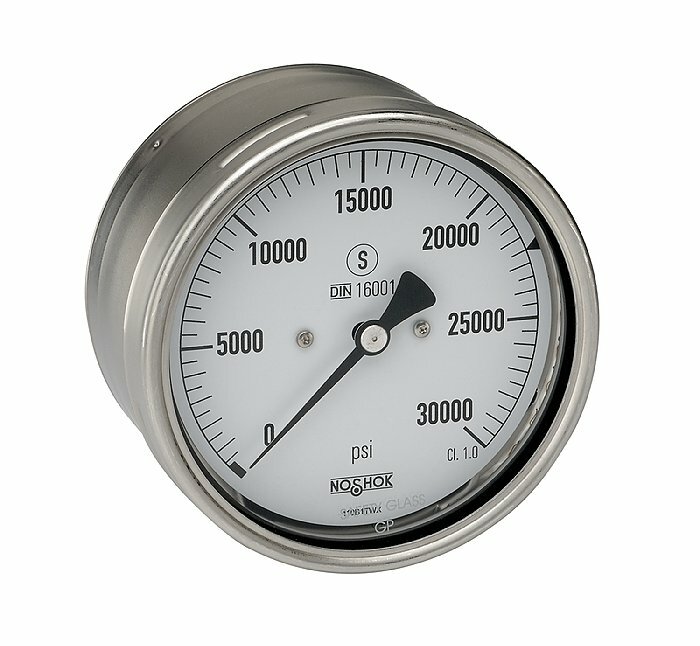 Featuring a durable 304 stainless steel case and a bottom connection, this gauge is ideal for local digital indication of pressure in place of mechanical gauges, with excellent accuracy and a variety of optional features including tare function, password protection, internal lighting, 300º rotatable base and rubber case protector. NOSHOK 2000 Series Smart System “Intelligent” Digital Indicators come standard with both a minimum and maximum pressure display, and employ advanced technology for a stable, drift-free readout. These indicators accept a variety of standard process signals and precisely scale them into any desired unit of measurement. They are field upgradeable with plug-in option cards, including 4 set point alarms, analog output and serial communication. Lift stations are facilities which are utilized in municipal and industrial water management and treatment, and mining applications. These stations utilize gravity conveyance to move water from lower to higher elevations, and direct the flow of water, wastewater or storm drainage often in low lying municipalities with flooding potential. Key elements of lift stations include a wastewater receiving well or wet well with a screen (to remove particulate materials), submersible pumps and piping with valves, motors, and an equipment control and alarm system. Due to the viscous and corrosive quality of the wastewater, storm water and sewage that is processed through a lift station, these systems require material compatibility with harsh media. Submersible pumps at the bottom of lift station storage tank are designed to pump suspended solids, sewage and slurry. Electronic pressure & level measurement is often used to identify blockages, back-ups and flooding. During pump staging, this indication can trigger alarms to turn on additional pumps in flood situations, equalize pump wear, and turn pumps off when tank levels are low. NOSHOK offers several submersible pressure & level measurement solutions to address these applications. Our 612 Series submersible transmitter features corrosion-resistant, stainless steel construction, and provides highly accurate, shock resistant and extremely stable performance over long periods of time. This sensor incorporates an advanced diffused semi-conductor and sputtered thin film sensor for maximum stability. NOSHOK also offers an anti-clogging 613 Series cage-protected submersible transmitter for use in severe high solids environments such as sewage, lift stations, storm canals, wet wells and slurry tanks where sludge, slurry or turbulence may be present. This transmitter features durable all 316 stainless steel construction and a large 2.14” diameter diaphragm which is extremely responsive, even when monitoring very low liquid levels or when buried in viscous media. The NOSHOK 613 Series transmitter is welded at the cap and base to provide a leak-tight seal and features a standard 1/2" NPT conduit for attaching lifting rings or mounting brackets. The NOSHOK Type 40 flow-through annular style diaphragm seal can be incorporated into the piping at the pump to offer a non-clogging seal, along with the NOSHOK 800/810 Series electronic indicating pressure transmitter/switch to provide feedback and alarms to the control panel. This system can warn the user of a high or low pressure situation that could damage pump(s) at the station. Hydraulic fracturing, or fracking, is a process used in nine out of 10 natural gas wells in the United States, where millions of gallons of water, sand and chemicals are pumped underground to break apart rock and release gas. These materials are injected at high pressure down and across into horizontally drilled wells as far as 10,000 feet below the surface. The pressurized mixture causes the rock layer to crack. These fissures are held open by the sand particles or other viscous materials so that natural gas from the shale can flow up to the well. Pressure transmitters play a critical role in the hydraulic fracturing process to monitor pressure at different stages in remote data monitoring vehicles including fracturing pumps, blending units and storage tanks. NOSHOK offers a portfolio of pressure measurement solutions which are ideal for these applications, providing extreme high pressure ranges and exceptional accuracy for pump protection and control operations. These transmitters are available in explosion-proof, ATEX-approved explosion-proof and intrinsically safe versions with G1B or G1/2B connections, offering a flush diaphragm connection that protects against plugging. These configurations are designed for measuring viscous fluids and are ideal for measuring pressure when fluid is pumped down the well. An alternative option is available using a standard NOSHOK transmitter with NPT connection. Any standard NOSHOK NPT transmitter with internal diaphragm can be assembled with a Type 20 front flush welded diaphragm seal to convert from an internal diaphragm to a flush Diaphragm. This package requires a very small footprint and protects against plugging in viscous media applications such as sand, drilling mud etc. NOSHOK’s versatile, heavy-duty Vapor-Actuated Remote Thermometers are ideal for remote panel installations on service trucks in the oil and gas industry. Because they are vapor actuated, these custom-made thermometers are not subject to error due to ambient temperature variations along the capillary tube, so they provide highly accurate readings above and below ambient conditions. NOSHOK offers Vapor-Actuated Remote Thermometers in 2", 2-1/2" , 3-1/2", 4", and 4-1/2" sizes to fit virtually any panel, and ranges are available from -40° to 60° F/C through 50° to 400° F/C. They are available with a brass or stainless steel case, with bottom, back or lower back connections. Options include dry or liquid fill (optional fill fluids include glycerine, glycerine-H2OD and silicone), front or rear flange, bezel, and U-clamp. APPLICATION: Remote pressure measurement on service vehicles including blending, frac, cementing, wireline, workover etc. SOLUTION: FM, CSA and ATEX approved NOSHOK Pressure Transducers and Transmitters in explosion-proof and intrinsically safe versions provide highly reliable performance. Mobile fire suppression systems are designed to protect critical equipment by automatically detecting and suppressing a fire at its inception. These systems are used on military, commercial, mining and heavy duty emergency vehicles. Most OEMs purchase various instrumentation and components from multiple vendors and then have to assemble the components into a usable sub-assembly. This can be cumbersome and costly. We provide a simple solution by offering a complete sub-assembly package which includes a pressure switch with molded connection, a molded solenoid valve connector and wiring harness assembly, ready to plug and play. We also provide a needle valve for manual actuation/shut-off when required. This complete system is a single part number and component, which makes ordering easy. Purchasing a packaged system from a single source also reduces cost. A NOSHOK 300 Series Compact OEM Pressure Transmitter, along with a NOSHOK 2000 Series Smart System Digital Indicator, is extremely effective in hydraulic presses to test the compression force of concrete. The transducer measures the tensile strength of the hydraulic press and sends the signal to the Smart System, which gives the operator a visual of whether the compression force on the press is correct . This NOSHOK product solution also works well in a variety of other applications related to presses, forgings, and stamping. A diaphragm seal is a device that is designed to isolate and/or protect a pressure measuring instrument from corrosive, viscous, contaminated or very high temperature process media. The pressure measuring element of the measuring device, and the instrument connection port are filled with a suitable liquid, utilizing state of the art vacuum filling technology, making pressure measurement a direct and simple process. Pressure, when applied to the surface area of the diaphragm causes it to flex and transfers the pressure through the fill fluid to the attached pressure gauge, transducer, switch or any pressure measuring device for measurement indication. Most often, when these conditions exist, a protective barrier can be efficiently installed to protect the pressure measurement device. The diaphragm seal or chemical seal comes in a variety of sizes and configurations to fit into almost any process installation. Diaphragm seals can be installed with capillary tubing and can be filled with high temperature rated fill fluid to protect the instrument from excessive heat. NOSHOK diaphragm seals can be installed with pressure gauges, pressure switches, pressure transducers and transmitters, and differential pressure gauges. We offer various materials of construction to offer protection in highly corrosive media and can often supply it with NPT or flange process connections. Think of NOSHOK when you are faced with aggressive media, and allow us to offer some ideas for a successful and safe installation. Our new 400 Series Heavy Duty Mechanical Switch is ideal for applications such as the opening and closing of gates, fly knife applications for machine tools and broken line indicators. In these applications, this robust switch is a reliable solution to prevent injuries and accidents. NOSHOK is a major supplier of pressure, level, temperature and force measurement instrumentation to the oil and gas market, including down-hole level transmitters, pressure and temperature transmitters and gauges, & needle and manifold valves. Below is a sampling of the products we offer for this market, but many more options are available. Please consult your Regional Sales Manager for details on our complete offering. A 316 stainless steel construction on many versions provides corrosion resistance and durability, making them ideal for harsh environments. Measuring ranges from 0 to 5 kN through 0 to 5000 kN are standard, with full scale accuracy ranging from ±2.0% (BFSL) to ±0.04%, depending on the particular version. Several amplified or unamplified outputs are available to interface with most electrical systems. They offer high shock and vibration resistance and small temperature drift. A conventional configuration provides internal threads to allow force to be easily introduced via suitable swivel heads. A connector plug is on the broad side of the body, and a cable socket is angled so that cable runs parallel to the direction of force, providing space-savings and a protected installation. A special version with integrated overload protection and a selectable measuring range is also available and is intended for applications in measurement engineering. Factory internal calibrations are performed in tension and compression — 4 to 20 mA and 0 to10 V, with a zero signal of about 12 mA and 5 V, respectively. An optional EPE01 programming unit allows selecting any of three different measuring ranges (100%, 50%, and 30%) without having to remove the force transducer. Overload protection is rated for 250% of the maximum nominal load. In crucial temperature requirement applications, temperature sensors must be durable enough to withstand extreme high and low temperature ranges while providing highly accurate and clear temperature or temperature gradient measurement. NOSHOK’s 850 Series Electronic Indicating Temperature Switch/Transmitter utilizes PT100 technology to provide continuous temperature monitoring, electronic temperature switching, and transmission of analog output of 4-20 mA while providing local digital indication. These sensors are cost-effective, easy to integrate, and play a critical role in the functionality and maintenance of many complex temperature-dependant systems. Temperature transmitters convert a low-level (ohm or mV) signal to a standard 4-20 mA current signal that can be easily read by a monitoring and control system, like a CDS or PLC. Two buttons on top of the 850 allow simple adjustment of the temperature set points, reset points, switching functions and the measuring range of the optional analog output. Its convenient 330° rotatable display-head and 4-digit LED display allow easy reading in any location. This sensor also provides one of the widest measuring ranges available (between -300°F and 1100°F/ -200°C and 600°C) to cover the majority of temperature measuring and switching tasks. A variety of stem lengths, which are also available with adjustable insertion lengths, add to the versatility of the NOSHOK 850 Series. All wetted parts, as well as its housing, are made of stainless steel for corrosion protection and durability. The temperature switch monitors the heating and cooling circuit and with the pre-determined switch points keeps it operating at optimum efficiency. The temperature switch in this application of large commercial or industrial size A/C units can be used to monitor the heat on the motor and cool or shut it down when exceeds set point. In this industrial composter the temperature switch can monitor and sustain the temperature of above 131° F needed for sanitation but also allow sufficient oxygen airflow for aerobic degradation without dropping below that temperature. In this application the engines coolant system can be monitored. When the temperature increases to the switch point other motors turn on to reduce load on the original motor or take over. In this application there are a number of situations the switch can be used for, such as monitoring boilers, coolers, machine and metal temperatures. In this re-circulating aquatic system, the temperature switch maintains the crucial temperature for good water quality as well as the health of the fish being raised for commercial consumption purposes. The temperature switch in this application monitors critical rail temperatures and alerts if any problems. With a standard accuracy of +/-1% Full Scale, NOSHOK’s Extreme High Pressure Gauges are exceptionally reliable in demanding applications. They come with a standard 9/16”-18 UNF 3B High Pressure Process Connection, and are available in standard dry or liquid-filled configurations with most standard options and accessories. Hazardous Environments require highly reliable, rugged instrumentation, especially when it comes to pressure monitoring in a remote environment like oil wellheads. NOSHOK provides a safe, reliable, rugged solution with our 621/622 Series Explosion-Proof Transmitters, and we back them with our exclusive 3-Year Warranty. These sensors provide consistently accurate and stable output, stand up to extremely harsh environments, and endure the test of time. The 621/622 Series Transmitters are engineered to the most stringent quality standards and undergo extensive testing, making them ideal for safe, dependable monitoring of tubing and casing pressures in a wellhead. With an accuracy of ±25% Full Scale (Best Fit Straight Line), combined with the reliability and long life of diffused semiconductor and sputtered thin film, they deliver outstanding performance and value. All wetted parts are made of 316 stainless steel and Elgiloy, and are welded with no internal O-rings, gaskets or seals. Available in a wide variety of pressure ranges to suit most applications, these transmitters can be specified with a standard threaded connection as well as a flush diaphragm configuration. They are Factory Mutual and CSA Approved to Class 1, Division 1 Explosion Proof, and all models incorporate significant levels of RFI, EMI and ESD protection, and are NACE MR0175/ISO 15156-3:2003 compliant. A low power model is also available. There are a wide variety of ways to measure liquid level in storage tanks and containers. Some are very sophisticated and some methods are very simple, with price points across the spectrum. As with any process measurement, there is not one single technology that will effectively address every application. Some of the approaches to level measurement include sight glass (reflex, transparent, or tubular glass), float switches, magnetic, capacitance, guided wave radar, hydrostatic tank gauging, submersible transducers, load cells, plus many other approaches. For example, in the process industry, tubular level indicators are commonly used for better visual liquid level indication. If the application is for non-contact type level measurement, radar type indicators or ultrasonic type indicators may be used. But did you know that level can be measured relatively accurately in vented or pressurized tanks by using a simple pressure gauge? In an upright cylindrical or rectangular tank, the head pressure of the fluid can be measured and converted to a level measurement. In both vented and pressurized tanks and vessels the specific gravity of the fluid being measured must be known. This application can work well with homogenous fluids but not with multi-phase fluids such as oil and water interface, as an example. For pressurized tanks a differential pressure gauge can be used. A differential pressure gauge has a high pressure inlet and a low pressure inlet to where the high pressure inlet is mounted to the bottom of the tank or storage vessel. This pressure point measures both the head pressure of the fluid plus the varying vapor pressure above the fluid. The low pressure inlet to the DP gauge only measures the varying vapor pressure. This essentially nulls out the varying vapor pressure at the top of the tank and leaves only the fluid head pressure. Again, if the specific gravity of the fluid is known, one can measure true head pressure and convert that reading into inches of water, feet of water, or whatever engineering unit desired to read level. In review, a vented tank would incorporate a static pressure gauge with an ultra-sensitive diaphragm or stacked bellows sensing element with a calibrated dial and pointer to indicate level in the engineering units desired. A pressurized tank uses the same technique but accounts for the varying vapor pressure above the liquid level in the tank. It is clear that there are several ways to address tank level measurement, and there is not a one size fits all solution. However, if the user wants a reliable level measurement in non-critical tanks or storage tanks and vessels, the technique using gauges could be the most cost-effective method. In addition to the costlier and more sophisticated measurement techniques being applied, many users incorporate the gauge method as a mechanical “backup” reading at the point of use for operations. There are many reputable manufacturers of pressure and differential pressure gauges worldwide. Finding the manufacturer or distributor/representative who understands the application and has applied it is the key to successfully implementing a solid mechanical level measurement strategy. NOSHOK has a half century of experience with this and countless other applications, and we are ready and waiting to help you with your Measurement Solutions. NOSHOK partnered with Magnus Engineered Equipment, a world leader in the design and manufacture of industrial parts cleaning equipment using specialized immersion cleaning technology, to provide Measurement Solutions for their cleaning systems. Magnus standard and custom systems are produced for parts cleaning, degreasing, and metal treatment using both aqueous and safety solvent systems for parts ranging from small intricate precision items to very large heavy machine parts. In July, Magnus delivered two machines equipped with NOSHOK instrumentation to a well-known company that manufactures the world’s most widely used family of mid-sized industrial gas turbines. Primary applications include electric power generation, oil and natural gas production, and natural gas transmission. NOSHOK’s 1000 Series Differential Gauges and 500 Series All Stainless Steel Liquid Filled Pressure Gauges were used to measure the flow of the customer’s cleaning solution through the filtration system. A high-quality gauge that will withstand vibration and shock is critical to the efficient operation of the filtration system. Filtration increases the life of the cleaning bath saving cleaning chemicals and downtime. NOSHOK’s 100 Series Mini Valves, and 400 Series Stainless Steel Needle Valves were used to control the pressure on the Magnus pneumatic lift systems. Magnus machines are built to last with many machines still in service after 30 years of continuous operation. The durability and performance of the NOSHOK product line is a perfect match for the machines designed and manufactured by Magnus Engineered Equipment. Magnus Engineered Cleaning Equipment also uses the NOSHK 800 Series Electronic Indicating Pressure Transmitter/Switch, and 615 Series High Accuracy Transmitters on their bearing cleaning systems. There is a vast variety of pressure and temperature measurement instrumentation, with countless options and specifications. When deciding on the best instrument for your application, there are several key factors to consider which can help prevent costly errors, inefficiencies and lost resources in the future. Review this checklist of the main points to consider when selecting the pressure or temperature measurement instrument which will provide the proper performance and longevity in your specific application. How important is accuracy in your application? In some industrial applications, repeatability may be more important than accuracy. Linearity and hysteresis may take precedence over accuracy in applications where process pressures vary widely. If accuracy is a very important factor, such as in low-differential, critical pressure applications, you’ll need to select an instrument that meets these requirements. As an example, a thermocouple may be chosen over a Resistive Temperature Measuring Device (RTD) in a temperature measurement application because it is more cost-effective, rugged and provides a wider range of measurement, while an RTD might be chosen if accuracy, repeatability and long term stability are the most important factors. An instrument’s range must be matched to the requirements of the application. For example, to ensure optimal control and monitoring of vapors, a Vapor Recovery Unit must have reliable instrumentation in place that is capable of accurately measuring low pressure. On the other end of the spectrum, if you have a high pressure application such as a water jet, you’ll need an instrument that can measure pressures of 60,000 to 80,000 psi. The environment of the application is a critical consideration when selecting pressure or temperature measurement instrumentation. Construction materials can be specified for harsh environments where the instrument may be subject to weather or temperature extremes, or corrosive media. To address applications where pulsation or vibration are a factor, fill fluids, Maximum Indicating Pointers, orifices or snubbers can be selected. Vibration due to pumps, motors, and other rotating equipment can cause excess wear and possible premature failure of internal working parts of a pressure or temperature measurement instrument. Vibration also causes difficulty in accurate reading of the instrument, due to pointer oscillation. One of the most common causes of failure is exposure to continuous vibration. It would be good for the user to be aware of these conditions, and work with your supplier for a solution. Process pulsation can occur around the discharge of pumps as well as quick operating valves. Many users assume that liquid filling the case of the instrument will fully address pulsation. Although liquid filling the case helps to dampen the effects of pulsation, it often does not fully address this process condition. Pulsation dampeners are installed upstream of the inlet to the instrument. Some common approaches are a piston-type snubber, a sintered metal snubber, or a threaded in-flow restrictor in the inlet of the instrument. A needle valve installed upstream of the instrument that is “pinched down” or slightly opened, is another common practice to address pulsation. It is not recommended to rely solely on a needle valve to address pulsation, due to the fact that the user could inadvertently open the valve, and thereby negate flow restriction. In clean fluids (gases or clean low viscosity liquids) a threaded orifice/flow restrictor or a sintered metal snubber is the most cost efficient way to address pulsation. In dirtier and higher viscosity fluids a piston snubber is usually recommended. In hazardous environments, the user should be aware of FM, CSA and ATEX approval requirements for electronic measurement devices. The user may also need to be aware of the various approaches to the application, which could include Intrinsically Safe installations, or Non-Incendive and Explosion-Proof installations. If unsure about which type of instrument is best suited for your environment, contact the manufacturer’s Customer Support team for clarification on these types of instruments. It is important to consider both the process and the ambient temperature when selecting measurement instrumentation. As an example with pressure gauges, for every 100 °F shift in temperature from which the gauge is calibrated, the user can experience up to a 2% additional error in reading. The cause is the change in the elasticity or spring rate of the Bourdon tube element with temperature. While it is difficult to circumvent the influence of ambient temperature, we can address the influence of process temperature. In the case of elevated process temperatures, the user will need to dissipate heat before it comes in contact with the measuring element of the instrument. In applications where the user is measuring steam, the common practice is to install coil or pigtail syphons to dissipate process heat. Another common practice is to install a diaphragm seal with capillary to separate the instrument from the high heat source. There are many options available with fill fluids in the seal and capillary system to withstand elevated process temperatures. In severe cold ambient conditions, the user may elect to heat trace their instrumentation. Some common methods for heat tracing can be electric or steam. For temperature measurement applications, the materials used in RTDs and thermocouples have temperature limitations which can be an important consideration. The sensing element used in RTDs generally contains a platinum wire or film, a ceramic housing and ceramic cement or glass to seal the sensing element and support the element wire. In general, platinum sensing elements can be exposed to temperatures up to approximately 1200 °F. Other materials such as Nickel, Copper and a Nickel/Iron alloy can also be used, however, their temperature limits are quite a bit lower than Platinum. Thermocouples are another common way to measure a process temperature, but the user needs to be aware of their temperature limitations as well. The location of the instrument in the process can be a significant consideration. Oftentimes the instrument must be mounted in a location that is not convenient for user interface. Possible solutions can include utilizing a swivel adaptor mounted to the inlet of the instrument to orient the instrument more toward the user, diaphragm seals and capillary to bring the indication closer to the user, or transmitters can be installed to allow a commonly used signal to be transmitted to a receiving device such as a digital indicator or PLC. The process mediums that are commonly measured include gas, liquids, and vapors which can be corrosive or benign. Careful consideration must be used with regard to chemical compatibility with the instrument’s materials of construction. In virtually all process variables that are measured, the user can elect a mechanical or electronic approach. With a mechanical approach, the user often requires a local indication. Examples include a pressure gauge or bimetallic thermometer which provide a dial or a pointer reading. Other examples might be a level gauge or flow meter that provide local indication. With an electronic approach, a transmitter or a switch can be utilized to provide a commonly used signal to a receiving device for remote monitoring and control. The user will need to determine what units of measurement are required for the application. There is a wide array of engineering units that can be used for all process variables, to include temperature, pressure, level and flow. In summary, it is essential to prioritize the requirements of the application before you make the investment in a measurement device. Addressing these 8 factors can help in achieving a successful measurement outcome. Working with NOSHOK for assistance can also help to achieve success in your application.